Kafari Strait is an extremely gorgeous region in Irans western province of Ilam with a long history that dates back to 3,000 BCE. The strait is a major tourist attraction of Ilam province and one of the most significant tourist sites of Badreh city. 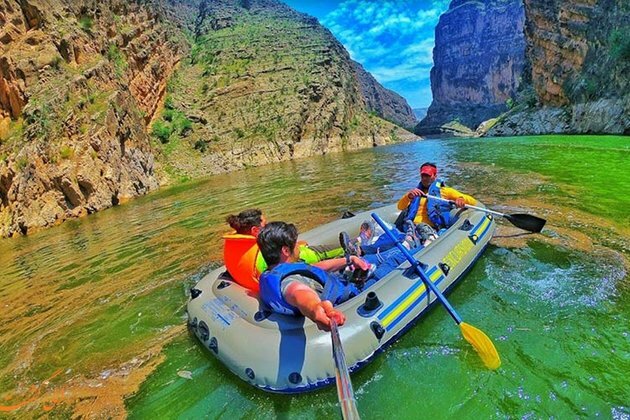 Overlooking Seimareh River and Dam, the strait is today among the most visited tourist sites in Ilam province. Kabir Mountain, Dinar Mountain and ManeshtMountain are the main natural causes that have created the strait. The region has been the subject of archaeological excavations over the past years. Studies estimate that the history of the region dates back to 3,000 BCE, and that life has been underway in it from the Bronze Age to the Iron Age. The strait is also called Shaddad (Solid or Firm). Its water comes from Kabir Mountain. During excavation operations in the region, the remnants of a site were found about 500 metres away from the strait. The site could be considered as one of the most important areas which flourished in this geographical location from the fourth millennium BCE up to the Sassanid era. The cultural relics obtained in the current season of excavation can lead to greater understanding about the different historical periods in the region. The region today is a perfect tourist resort. Locals ride boats along the river and take tourists for a tour of the region. Some others catch fish in the Seimareh River. The passage of the river through the strait is among the main tourist attractions of the region. Among other beauties of the region, one can refer to a massive oak forest and the presence of various animal species like Iranian squirrel in the region. The strait is about 2km in length and stands about 700 metres above the sea level. There is a spring about one km away from the strait. There is also a shrine near the strait.